It is situated at the edge of Pagasitic gulf and at the foot of Mountain Pelion. The roots of the modern city lay back to the mythical times. 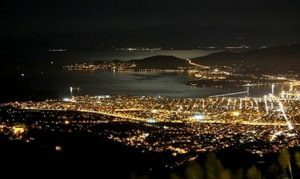 Volos of today was once ancient Iolkos, the homeland of Jason, the ancient Greek hero who sailed to Colchis with the ship Argo and his Argonauts. Through the myth of Jason’s expedition, Argo has become the symbol of the city. Today , the modern city of Volos, beautiful and friendly to all of the visitors , situated almost in the middle of the distance between Athens and Thessaloniki, an industrial city with a large port. The meeting point for locals and visitors is the beach , one of the most beautiful strolls in Greece. Starting from the sculpture of Argo, walking through the waterfront Argonaut Road , people can come till the other side of the promenade where it is located part of the University of Thessaly and even further the cathedral of Volos, dedicated to St Constantinos . It is interesting to visit also the Archaeological Museum of Volos, Athanasakeion museum. The building that houses the museum is an excellent example of the neoclassic architecture of 1909.Very close to the Archaeological museum, there is a big park, where visitors can see beautiful copies of houses of the Neolithic era. 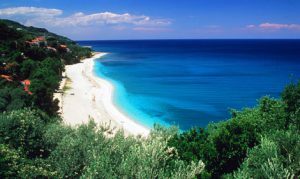 The mountain of Pelion is forming a peninsula between the Pagasetic gulf and the Aegean sea. This combination of the mountain and the sea makes the area to be a popular destination through the year .Pelion, the homeland of Centaurs, is a place of great natural beauty, a mountain with traditional villages and beautiful beaches .It is forested with beech, oak, maple and chestnut trees .The highest summit is 1624m and there are many easily accessed peaks, good for hikers and mountain climbers. 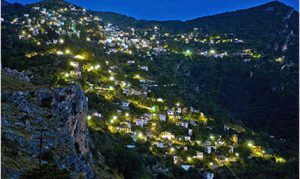 There is also a ski resort, near the village Chania .Modern Pelion has 24 villages that they maintain the traditional Pelian architecture. Villages, either near the sea or on the top of the mountain, that all of them offer a fantastic view of the surroundings. On the way from Volos to Pelion, the villages Portaria and Makrinitsa, known as the balcony of Pelion. Other beautiful villages are, Tsangarada, Zagora, Milies, Vizitsa, AI Giannis, Kissos and so many more for all the visitors, for all the times, for all the tastes and for all the ages. Pelion is waiting to be discovered and to be loved! !